Running a small business means keeping a lot of different balls in the air. There are text, presentations, spreadsheets, and other documents you need to share. Files you need to collaborate on with others, sometimes across different time zones. And then there’s all of the critical information, like legal contracts and forms, you and your employees need to access. We are in a golden age for productivity apps. There are robust apps available that go beyond the productivity and document features you’d expect. Many of them extend or innovate the entire concept of documents in powerful ways. Take a look and see how these 13 powerful organization and productivity tools can empower your small business with easy, accessible design. Your business – and your headspace – will thank you for it! Quip is a suite of office productivity apps with some powerful add-ons and features. Its founders (Bret Taylor and Kevin Gibbs) have extensive experience with some of the biggest online properties. Taylor was the co-founder of Google Maps, CEO of the ill-fated social network FriendFeed, and former Facebook CTO. Gibbs was the founder of Google’s App Engine. Quip initially started as a collaborative word processor and spreadsheet apps. 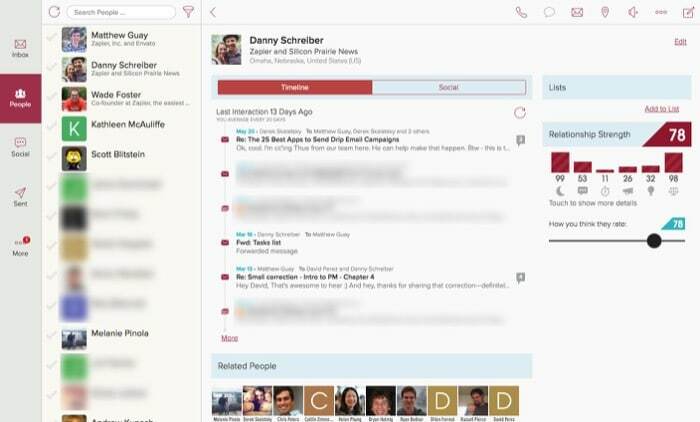 Over time the company built out new features like team chat, presentations, and document history. Quip recently launched “Live Apps.” It’s a powerful feature that gives users the ability to embed external services and apps directly in your documents. Quip is a fantastic way to work with all of the standard documents a small business relies on with robust collaboration features and app integration. Free trial, prices start at $30/month for 5 users. Airtable describes itself as “part spreadsheet, part database,” but there’s a lot more going on than just a replacement for Excel. The service takes the concept of spreadsheets and runs with it. Where Excel is hyper-focused on numbers and formulas, Airtable treats all kinds of data equally. Airtable documents can contain images, videos, maps, and more in addition to the usual numbers and text. What elevates Airtable even further is it lets you create different “views” of your data. Want a form that takes input and stores it in a spreadsheet? Or graphs, charts, and other visualizations alongside your data? How about embedding a Google map or a 3D model? Airtable can do this and more, all in a friendly design that doesn’t feel overwhelming or cluttered. And this is one of Airtable’s key features: it manages to take the complexity and visual overload of spreadsheets and make them seem, dare we say it, fun. With an extensive gallery of examples and real-life use cases to choose from, if you have data to organize, there’s a good chance Airtable can handle it. It would be a great tool, for example, if you’re figuring out how to start a clothing brand or clothing line. You can quickly organize your visuals, financials, and other info. Free, with plans starting at $10 a month. If Airtable is all about making spreadsheets more accessible, Coda is about blowing up your concept of what a spreadsheet is. Like Airtable, Coda documents accept a long list of file types, but that’s where the similarity ends. Coda documents can contain paragraphs of text followed by embedded tables of data alongside little apps that let you manipulate and add new information. Coda’s Doc Gallery showcases a long list of ways you can take advantage of this office doc mashup. There are templates for everything from project planners and investor worksheets to more fun uses like baby naming apps and wedding planners. As with many of these new twists on old ideas, Coda can have a bit of a learning curve. It’s such a flexible and powerful tool, however, that you might get more out of it than you put in. Coda is still invite-only, but it’s not difficult to get access, and currently, all features are free. Whimsical may have a silly name, but its features are anything but that. Initially, it was released as a well-designed, fast to use flowchart app. Major updates added wireframes and what Whimsical calls “sticky notes” to the mix. One of the core qualities of its suite of apps is a focus on speed. Whether you’re creating a flowchart, wireframe, or organizing a set of sticky notes, everything is fast. It takes little effort to create a well-organized document with a fun but professional look, thanks in part to the app’s vibrant purple theme. One of Whimsical’s direct competitors is the web app veteran Lucidchart. 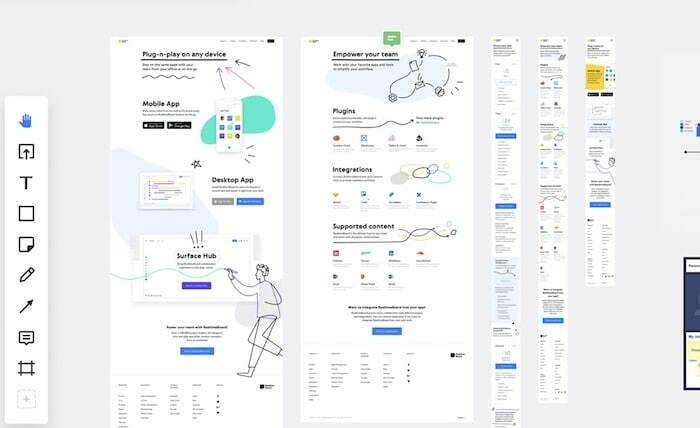 Both feature flowcharts and wireframes, but Whimsical wins out with its user-friendly design, fast content generation, and eye-pleasing theme. As a web-based app, Whimsical supports real-time collaboration out of the box and has robust support for comments and annotations. You can also export your creations as PDFs or PNGs, and share a link to the document with others who can view it for free. Whimsical offers 5 free boards to start, with plans starting at $10 per user per month. With so much of our lives in the cloud, it’s increasingly difficult to know precisely where a particular file might be. Were the files for your most recent business logo design saved to Dropbox? In Trello? In your email? On your laptop? FYI aims to solve this problem. After you’ve added the services, you’ve used to the service (and installed an app on your computer) you can search across all of them quickly from the FYI website. For people with multiple cloud storage accounts or apps like Trello, Github, or Asana, FYI’s global search can be a huge timesaver. FYI is free for up to four connected apps and search that covers the last 30 days. For unlimited apps and search that goes back two years, it’s $8 per user per month. Go into almost any office and chances are you’ll see at least one whiteboard. Their ability to gather a group of people’s ideas and thoughts onto a shared, public space is invaluable. How to replicate their benefits for remote workers and distributed teams is a challenge many companies face. Enter RealtimeBoard. This online whiteboard platform has continually improved and added new features since its debut in 2011. In addition to basic whiteboard features like drawing, text, and sticky notes, RealtimeBoard also boasts mindmapping, charts, embeddable media, and a ton more. If your company needs to collaborate with remote workers, or if you’ve wanted a way to integrate your whiteboard with features like video chat, screen sharing, and much more, RealtimeBoard might fit the bill. For example, if you’re working on a project, such as creating a brand identity for a new business, you’ll need to collaborate with your co-founders and likely with your designer. Collaborating by email is tough and you’ll end up loosing a lot of time and information. That’s where products like RealtimeBoard are really useful. Notes, like calendars and email, are a crucial part of most people’s lives. So it’s no surprise there are almost as many different note apps and services available as there are people. One of the best is Notion. Notion quickly became a darling of the maker and app entrepreneur world after its launch in 2016. That year, it was voted the Best Desktop App that year by the community on Product Hunt, an influential site for new product launches. It’s easy to see why. At its core, Notion is a note-taking app, but one that extends the note experience in a multitude of ways. 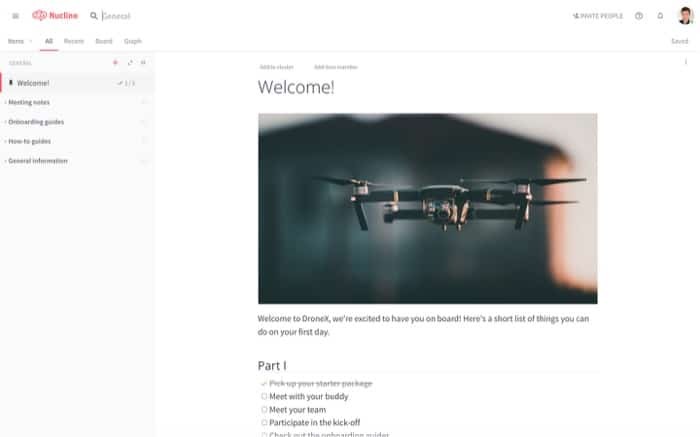 You can embed many different types of content within a Notion “page”, like tables, calendars, galleries, kanban boards, and much more. People can collaborate in real-time, as well as comment and tag items the attention of others. Notion bills itself as the “all-in-one workspace.” Through its extensive feature set, collaboration features, and integrations, that claim may not be just a passing notion. Business contracts are a pain for entrepreneurs and small businesses. They’re often impossible to understand, require expensive attorneys, and constantly create friction with vendors, employees, and others. 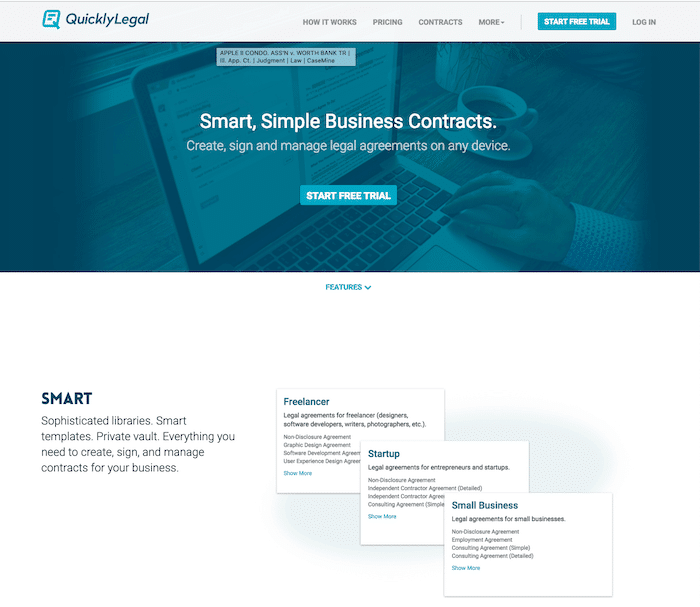 Quickly Legal helps you create, sign, and manage legal agreements on any device, at any time. Confusing and ambiguous contracts often lead to problems and costly lawsuits. Quickly Legal contracts are easy to understand. With clear terms, all parties know what to expect. Plus Quickly Legal helps you to electronically sign the contracts, and you’ll always know the status of each contract. A nice selection of contracts for startups and small businesses (non-disclosure agreements, employment agreements, sales representative agreements, independent contractor agreements, and more) and also freelancers and others. Plus, you’ll have all your signed contracts in a single convenient contract vault securely stored in the cloud. Nuclino was created to solve this problem. The service aims to gather all of a company’s knowledge in one place through its combination of notes, images and video, visualizations, and tagging features. Nuclino shares many features with other note-based apps like Notion or Notejoy but focuses more on knowledge base-style documentation than individual notes. “When are you available?” This question can be challenging to answer if you’re trying to organize a meeting with someone outside of your organization. It’s equally difficult to let the world know when you’re available. Calendly attempts to solve this problem. It connects to your existing calendar and finds times when you are available. It makes these available to people visiting your personal page so they can book time with you. 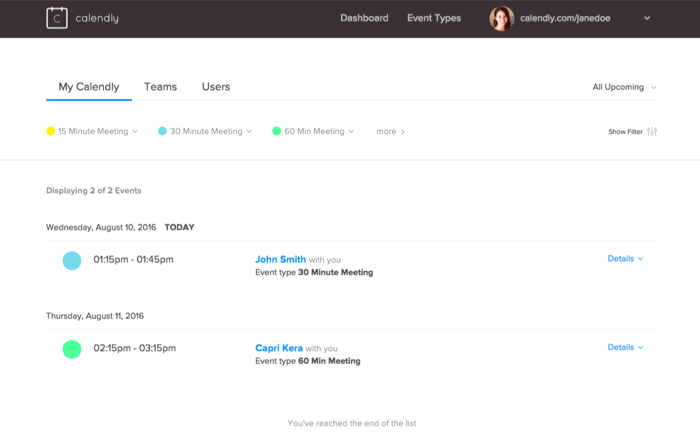 You can integrate your calendar with apps like Zoom, GoToMeeting, Salesforce, and more. It works with Google Calendar, Outlook, iCloud, and Microsoft Office. Calendly is one of those apps that solves a single problem well. For people who take a lot of meetings it’s an invaluable service that makes answering “when are you available?” a simple click away. Lists make the world go round. Who doesn’t like making a list? It’s a simple but powerful way to organize your thoughts, keep track of your tasks, and much more. Taskade takes the list concept and blows it up into something bigger and infinitely more useful. It features what you’d expect from a list: bullets, checkboxes, number lists, and even hearts. Where Taskade shines is how it enables users to collaborate on list items and organize items through a variety of views. You can view your tasks as a board (ala a site like Trello), “Action” view (which turns the list into a table with actions), or as a standard list. Collaboration features play a significant role in Taskade. You can chat with other users via text, voice, and even video, which makes working on a shared list or tasks easy. You can also attach files to a list item, set a due date, or tag it with a co-worker’s name for their attention. All of these features are wrapped in a friendly, colorful design that makes working with lists easy and fun. If you need to create a list (and almost all of us do), Taskade may end up your number one choice. When it comes to organizing your thoughts, one of the best methods is to use a mind map. The term “mind map” was first popularized in the 70s by British psychologist Tony Buzan. The act of organizing thoughts in a tree-like structure, however, has been with us for centuries. Mind maps are deceptively simple. Their power is in their ability to organize vast amounts of information in a visually attractive, easy-to-follow system. If you have a subject or idea you need to get out of your head, the freeform nature of mind mapping may be the right tool for you. There are many mind mapping options available, but one of the best is MindMeister. This online service got its start in 2007 and has steadily grown in popularity and features. It now boasts over 7 million active users and is localized in 12 different languages. 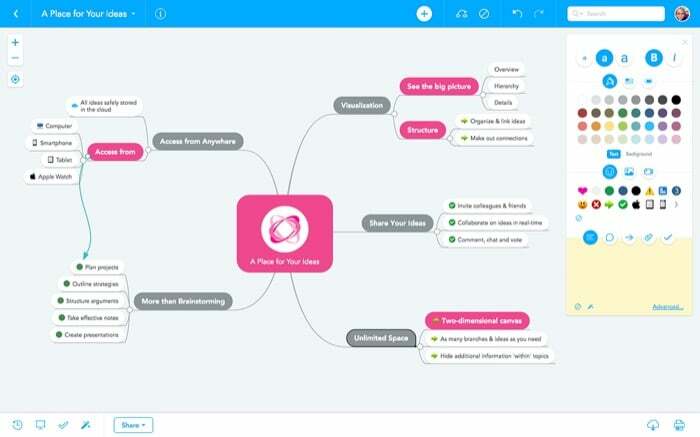 In addition to the online service, MindMeister has iOS and Android apps and integrates with a number of popular online storage and productivity apps. Free, with plans starting at $4.99 a month. Organizing your contacts can be a real pain. The information you have may be incomplete, full of duplicates, or plain wrong. Preventing your contact list from exploding into a chaotic mess often requires a lot of tedious pruning and gardening, and who has time for that? Cloze thinks it has a solution. It’s an online service that imports your existing contact list, find duplicates, and scours the social web for updated information. It aims to be your central source of truth for the people and businesses you interact with. It shares some features with customer relationship management (CRM) apps (which we wrote about recently) but is easier to use. The focus is to provide you with everything you need to know about your contacts without burying you in data. If you have a contact list, chances are good that it could use tidying up. Cloze helps make your contact list work for you. Free, with plans starting at $19.99 a month. There are a number of organization apps out there, but only a few have proven to be worth their while. 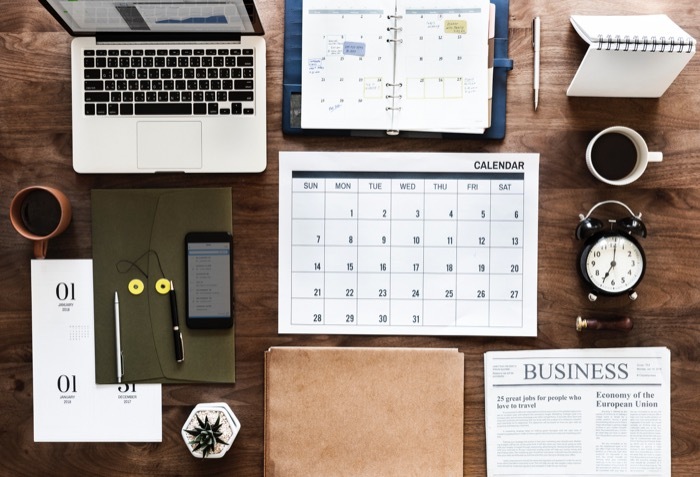 This carefully curated list contains only the apps that can best help every business owner increase their productivity with stronger organization tools – be sure to take a look.